Atina is a journalism graduate from the Schools of Arts and Sciences. She chose City due to the great reputation of the Journalism Department. I was studying intensively biology and chemistry in my high school. Yet, I published two novels and took part in some national and international writing contests. This helped me reach the conclusion that I want to study journalism. City, University of London has a wonderful reputation, especially regarding its journalism degrees. Its high position in the global ranking convinced me straightaway. I am very grateful to have been taught by journalists who have worked for some of the most well-known media outlets here and abroad. The variety of modules was extremely good – from political scandals to international news to visual journalism. We did so much practice that we are fully aware of how a news room operates at the highest standard. I was part of the Bulgarian society which helps me preserve the connection with my country and my nation. 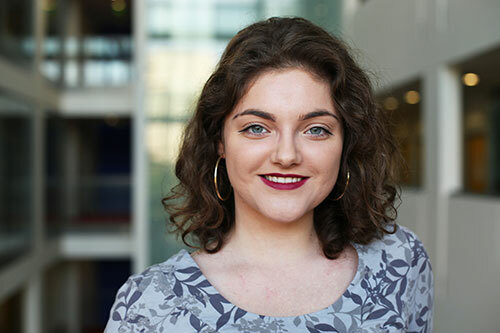 I am also working as a Student Ambassador which allowed me to create bonds with a range of people and be part of exciting events on campus. Apart from that, my job as a deputy editor of an online news outlet contributed a lot to my understanding of journalism. Have you had the opportunity to do any internships, placements of work experience? Thanks to the knowledge I have gained at City, I managed to do internships with The Times, The Sunday Times and the Guardian. I also worked at the BBC as a sub-hub assistant over the 2017 General Election. Opportunities with local newspapers such as Islington Gazette and Hackney Gazette gave me a great option to improve my skills as well. The most exciting part since I came here has been the opportunity to publish plenty of articles and videos for national and international news outlets. This has really boosted my portfolio. Invest energy, be determined and self-confident. City will boost your creativity, but make sure you are always looking for more stories and exciting interviewees. Read as much as you can about as many topics as possible.